Sri Lanka’s first-ever insurance cover for its artisans and craftsmen will commence this March. The insurance scheme, initially proposed by President Maithripala Sirisena in 2017, has been a rallying cry by many local craftsmen for years. Meanwhile, the second national census of the country’s handlooms sector too is to be completed by March. “The handicrafts sector is one of the largest self-employment sectors in Sri Lanka,” said Minister of Industry and Commerce, Resettlement of Protracted Displaced Persons and Cooperative Development Rishad Bathiudeen yesterday. 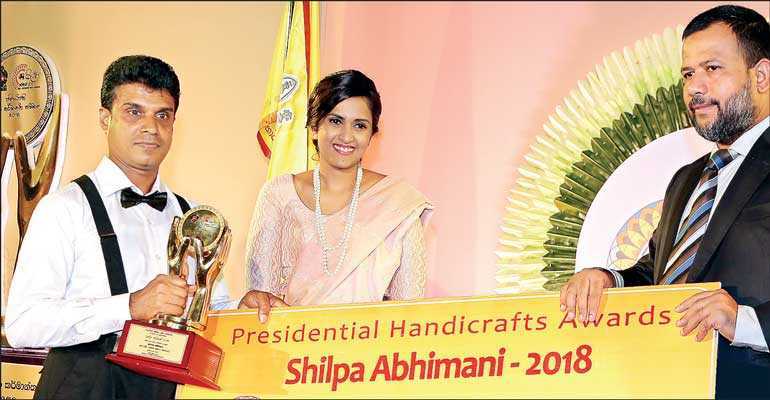 Bathiudeen, joined by National Crafts Council Chairperson Heshani Bogollagama and craft award winners, was addressing the Shipa Abhimani 2018 Presidential Awards event at Battaramulla. “I am pleased to say that for the first time in our handicrafts history, we are introducing Sri Lanka’s first insurance scheme for our crafts-people. This insurance was first proposed by President Maithripala Sirisena in 2017. We are investing Rs. 7 million for this scheme,” said Bathiudeen. He added: “This scheme is called ‘Shilpa Suraksha’ and will cover 23,000 craftsmen by 2023. The first stage will be launched this March giving coverage to 5,000 craftsmen. We are also introducing new digital technology to Sri Lanka handlooms sector which closely works with handicrafts. We are planning to introduce nine hi-tech Jacquard handloom design machines to the nine provinces to upgrade this sector for the first time after many decades. Sri Lanka’s first artisan insurance scheme shields lives and accidents of craftspeople and not their product/vendor liabilities. Lately the NCC has expanded its crafts training. More handicraft training centres under NCC now conduct various courses around the country for its present and future craftsmen. Over 100,000 craft-makers are estimated to be engaged in Sri Lanka’s handicrafts and 28,000 of them are registered with the National Crafts Council, for whom this insurance will be given to. The local handlooms sector also works with handicrafts (Lankan handloom output was estimated at $ 10 million in 2011/’12). At the 24 January event, five Lankan artisans also collected World Craft Council Asia Pacific’s Award for Excellence from Minister Bathiudeen.